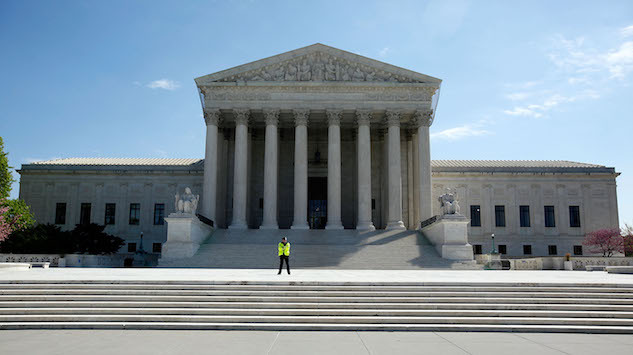 The Supreme Court ruled unanimously on Monday to keep district lines in Wisconsin and Maryland that were challenged by residents for partisan gerrymandering, reports The Washington Post. These controversial district maps will be used in the upcoming midterm elections, and justices sidestepped the question of whether or not these maps are legal. The first case involved voters in Wisconsin who argued that the district maps were drawn to favor Republicans. The second case included voters in Maryland where the incumbent is not running for re-election in the upcoming midterms. The challengers stated the map of one district was drawn to elect a Democrat. The court ruled to keep the current district lines in both states. Basically, the Supreme Court stated the challengers lacked evidence that the district lines had caused “irreparable harm.” The Maryland case was pending in a lower court until the Supreme Court announced their decision. The case will now proceed in the lower court. In Wisconsin, the challengers wanted the court to look at the entire state map as a whole and how it has been impacted by gerrymandering. The court ruled that they must assess the districts one at a time and the challengers must present them district by district. The Supreme Court constantly monitors how electoral maps are drawn in each state and are in charge of policing racial gerrymandering. However, the court has never found that a state’s partisan district lines were extreme enough for them to be policed as well. The Wisconsin and Maryland decisions were a technical approach to the partisan gerrymandering issue, and ultimately a way to avoid dealing with it before midterms. However, even if the Wisconsin case doesn’t make it back to the Supreme Court, there is another gerrymandering case pending Supreme Court review from North Carolina. The state is a midterm battleground state, with Republican’s holding 10 of 13 districts. The challengers are prepared and have plaintiffs challenging each district as instructed by the court in the Wisconsin case.